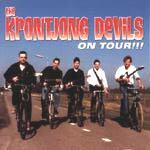 Holland's Krontjong Devils belt out low fidelity ultra reverb garage surf, pummeling parties and frat houses across the land. This CD is a collection of wild imprecisely documented performances of boundless energy, including several vocals. This is one dark and menacing track, with evil tones and hints of "Moment of Truth." It is a riff driven powerhouse, with a ton of energy. The mix buries the drums a bit too much, and the rhythm guitar is mostly buried as well. This is a so-so rendering of the standard, with a the organ is somewhat in the way due to the bad mix. Energetic and loud. This cover of Satan's Pilgrims is way reverbed, almost to the point of the Flat Duo Jets. It's funky and fun, and well delivered. Thundering over reverbed mix that works ok, but could be much better. Cool Euro melody, with plenty of energy and cool arranging. It's got the Cossack feel, a fast version of the "Voyaging to Vinland" (Robert Calvert) ethic, and a whole mess of suave flow. Very cool track. A super muddy session of the Toad's "Morpheus," with very little definition. It sounds like it's in a pool hall across the street. Competently delivered. This is a spirited rendering of Davie Allan's "War Path," played really well but buried in bad ambiance and too much room 'verb. The drums are almost lost. This is the Dave Myers & the Surftones tune they released on the Del-Fi compilation "KFWB Battle Of The Surf Bands." It's very well laid out, with more edge and less intensity. The lead tone changes the character of the song, but it works well anyway. Nice track. Ringing lead tones and an infectious melody, muddy sound, and an overall sound that keeps reminding me of the Au Go-Go's (Marty Balin) "All Over Town." It's quite well played and entertaining, just muddy. What a monster of a low-E rumbler. Fine melody line, and splendid playing. The melody is very similar to the Blazers' "Bangalore" in some respects. Muddy, but listenable sound.